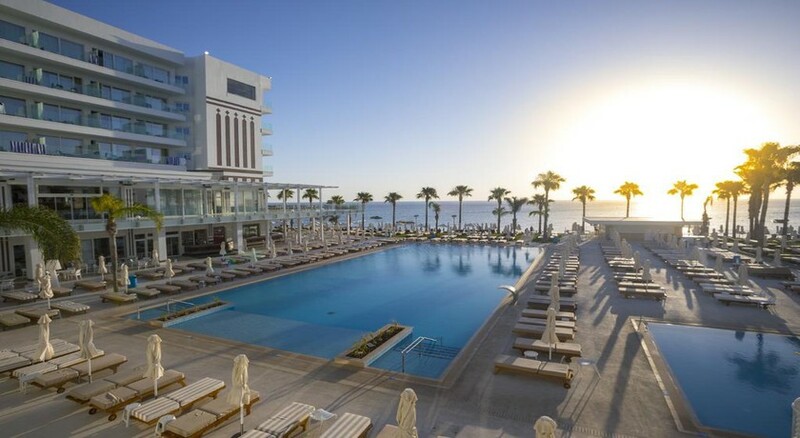 Constantinos the Great Beach Hotel is located in the beautiful region of Protaras, that enjoys top attractions, beautiful beaches and an excellent assortment of restaurants that cater to international and local tastes alike. 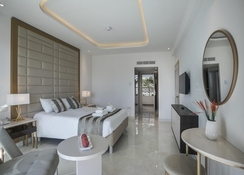 All rooms at Constantinos the Great Beach Hotel are well-furnished with elegant interior décor that makes for a relaxing place to spend your holiday in Cyprus. Protaras offers visitors many great bars and al fresco dining experiences that allow you to combine fine food with amazing views of the clear blue waters of the Mediterranean. There are also conveniences nearby such as food shopping and souvenir shops. It’s easy to enjoy yourself out in Protaras with highlights including the golden sands of Sunrise Beach, the Ocean Aquarium with its lush tropical gardens as well as an unforgettable night to be had at the Magic Dancing Waters Live Show. 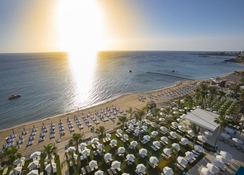 Constantinos the Great Beach Hotel is situated within the beautiful region of Protaras right on the beachfront making getting down to the stunning Sunrise Beach no fuss at all. Larnaca International Airport lies just 48km from the hotel. There are a wide array of great restaurants catering to tastes from around the world as a short trip along Protara Road offers Italian, fresh Mediterranean seafood and a variety of Greek and Cypriot tavernas. There are also many bars within easy walking distance that combine refreshing drinks with beautiful views over the sea. You will also find two supermarkets nearby and great entertainment at Magic Dancing Waters Live Show just a five-minute walk from the hotel. Accommodation at Constantinos the Great Beach Hotel comprises of 153 rooms, all of which are equipped with essential amenities such as air-conditioning, T.V., wi-fi, telephone, safe deposit box, ensuite bathroom as well as either a private balcony or terrace. No matter what type of room you choose, they will be exquisitely decorated with a light colour scheme with little flourishes of colour that enhance the atmosphere. Standard rooms are comfortable and spacious and generally, sleep, two guests. 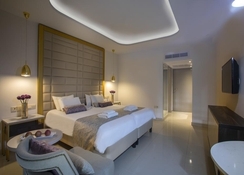 The Family Suite offers a view of the Mediterranean Sea with a living area in which to spread out in as well as a jacuzzi in the private bathroom, King Size bed and a sofa bed that converts to accommodate an extra guest. 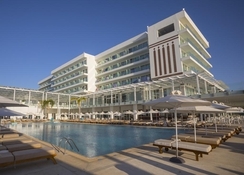 Constantinos the Great Beach Hotel houses two a la carte restaurants, one serving Chinese cuisine and the other Mediterranean cuisine. 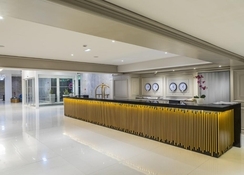 In addition, there are two buffet restaurants and three bars, so you’re never short of a great place to grab a bite to eat or a refreshing drink. Outside of Constantinos the Great Beach Hotel, it’s a case of taking your pick from the great selection of restaurants on offer. Sample delicious traditional Greek meze and Cypriot dishes at Andama Taverna or pop to Promises or Marcello’s for fine Italian. If you’re looking to grab a drink out on the town then Rockafellas Bar is ideal for those who want to watch live sport whilst Rives Entertainment Bar has live music. 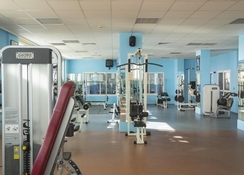 Constantinos the Great Beach Hotel has a gym for those who want to keep up with their exercise plan. There are also two swimming pools as well as a pool for children. Unburden your cares and stress at the spa with a massage, sauna or steam bath and therapies on offer too. A daily family-friendly daily entertainment programme runs that offers a little something for everyone such as theme nights with live music. The Magic Dancing Waters Live Show will amaze and astound adults and children alike, so make sure to spend a night being entertained here. A day trip to Cape Greco National Forest is an ideal way to see even more of Cyprus’s beauty this time its lush forestry that runs along a charming rugged coast and of course check out Sunrise Beach, one of Cyprus’s best.